In the World Library of Psychologists series, international experts present career-long collections of what they judge to be their finest pieces - extracts from books, key articles, salient research findings, and their major practical theoretical contributions. Elaine Funnell has played an important role in the study of neuropsychology over the past 25 years. She has been at the forefront of groundbreaking research on individuals suffering with acquired disorders of written and/or spoken language resulting from brain damage. 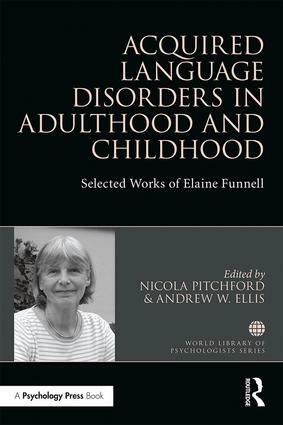 With commentary by Nicola Pitchford and Andrew Ellis, this volume presents Elaine’s most significant contributions in her two main specialist areas: adult neuropsychology of semantic disorders, with a focus on disorders of naming in dementia, and acquired language and literacy disorders in childhood. The publications included in this volume date back to 1988, where Elaine co-authored a major review of theories regarding the representation of meanings in the mind and brain. They then bring us right up-to-date with a previously unpublished paper from 2010, which has been recently edited by the co-author, Mike Kopelman, for this edition. Through her exceptional work, Elaine has greatly advanced our understanding of the brain processes behind written and spoken language, and this book represents an original and timely contribution to the field. Acquired Language Disorders in Adulthood and Childhood will be of great interest to researchers and postgraduate students in adult and child neuropsychology, specifically for those specialising in semantic and language disorders. 1. Riddoch, M. J., Humphreys, G., Coltheart, M., & Funnell, E. (1988). Semantic systems or system? Neuropsychological evidence re-examined. Cognitive Neuropsychology, 5, 3-26. 2. Funnell, E. & Sheridan, J. (1992). Categories of knowledge? Unfamiliar aspects of living and nonliving things. Cognitive Neuropsychology, 9, 135-154. 3. Funnell, E., & de Mornay Davies P. (1996). JBR: A reassessment of concept familiarity and a category-specific disorder for living things. Neurocase, 2, 461-474. 4. Funnell, E. (1995). Objects and properties: A study of the breakdown of semantic memory. Memory, 3, 497-518. 5. Funnell, E., & Hodges, J. R. (1996). Deficits of semantic memory and executive control: Evidence for differing effects upon naming in dementia. Aphasiology, 10, 687-709. 6. Funnell, E., & Kopelman, M. (2016). Interaction and accommodation between past-tense regular and irregular verbs: Evidence from neuropsychology. 7. Pitchford, N. J., Funnell, E., Ellis, A. W., Green, S. H. & Chapman, S. (1997). Recovery of spoken language processing in a 6-year-old child following a left hemisphere stroke: A longitudinal study. Aphasiology, 11, 83-102. 8. Pitchford, N. J., & Funnell, E. (1999). An acquired form of developmental phonological dyslexia. Cognitive Neuropsychology, 16, 573-588. 9. Funnell, E., & Pitchford, N. J. (2010). Reading disorders and weak verbal IQ following left hemisphere stroke in children: No evidence of compensation. Cortex, 46, 1248-1258. 10. Pitchford, N. J., Funnell, E., de Haan, B. & Morgan, P. S. (2007). Right hemisphere reading in a case of developmental deep dyslexia. Quarterly Journal of Experimental Psychology, 60, 1187-1196. 11. Funnell, E., & Wilding, J. (2011). Development of a vocabulary of object shapes in a child with a very-early-acquired visual agnosia: A unique case. Quarterly Journal of Experimental Psychology, 64, 261-282. Elaine Funnell recently retired as Emeritus Professor of Neuropsychology at Royal Holloway, University of London. Her work studied the cognitive processes involved in language, semantic memory and disorders of visual perception.